There has been a lot of talks since the initial announcement of Crisis on Earth-X was made about weddings and relationships. There have been some rumors floating around and we know that just because it’s a crossover, it doesn’t mean that the shows won’t do something major during it. So, below, here are a few spoilery things that have come up rumor wise for the 4-hour Arrowverse crossover. Keep an eye on Firestorm. It broke a few weeks ago that Victor Garber aka Martin Stein was likely leaving DC’s Legends of Tomorrow as he will be heading back to Broadway. They’ve been setting up his departure all season with the birth of his grandchild and now them looking for a way to combine the Firestorm matrix into Jefferson Jackson (Franz Drameh) alone. It’s worth noting that neither of the two characters appear much in the trailers nor in the released photos. And the one time we do see them, Jax looks injured. In an interview about the episode, Stephen Amell included the relationship between Stein and Jax as one to keep an eye on during the crossover. Don’t be surprised if we take a major step forward towards Garber leaving. Amell, Tom Cavanagh and Melissa Benoist may not be the only ones playing different versions of themselves. We know that Alex Danvers (Chyler Leigh) is the only one who comes with Supergirl from Earth-38, but we see actor Jeremy Jordan aka Winn Schott in scenes with Wentworth Miller aka Citizen Cold. And there has been some talk about Paul Blackthorne aka Quentin Lance appearing in a Nazi Uniform. How many other actors will show up as their Earth-X counterparts remains to be seen. The trailer for Freedom Fighters: The Ray showed multiple heroes fighting alongside The Ray. They included Phantom Lady, Red Tornado, Black Condor and one that looked a bit like Timber Wolf from the Legion of Super-Heroes but can’t say for sure. 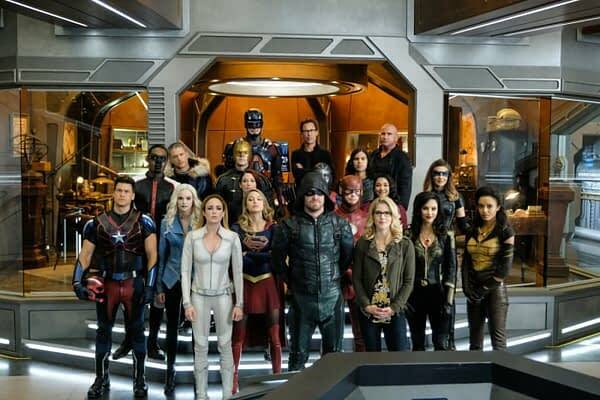 Hasn’t been expecting any of them in the crossover, but a recent teaser image showed Red Tornado as well as a metal figure that could be one of the A.T.O.M. drones from Legends season 1, Metallo or even a 80’s version of Brainiac. Three has been hints of possible sparks between The Ray (Russel Tovey) and Mr Terrific (Echo Kellum) and Heat Wave (Dominic Purcell) is interested in Killer Frost (Danielle Panabaker). But the big relationship stuff is the wedding of Barry Allen (Grant Gustin) and Iris West (Candice Patton), which is believed to happen at some point… and there has even been talk of it becoming a double wedding with Oliver Queen and Felicity Smoak (Emily Bett Rickards) getting hitched at the same time. And of course, the big surprise will be who is the Earth-X Prometheus. Some names fans have suggested for whose under the hood: Jamey Sheridan, Colin Donnell, David Ramsey, Colton Haynes and possibly executive producer Marc Guggenheim himself. Now that would be a twist. Wanna See A Bit Of The Drunk History Christmas Special?